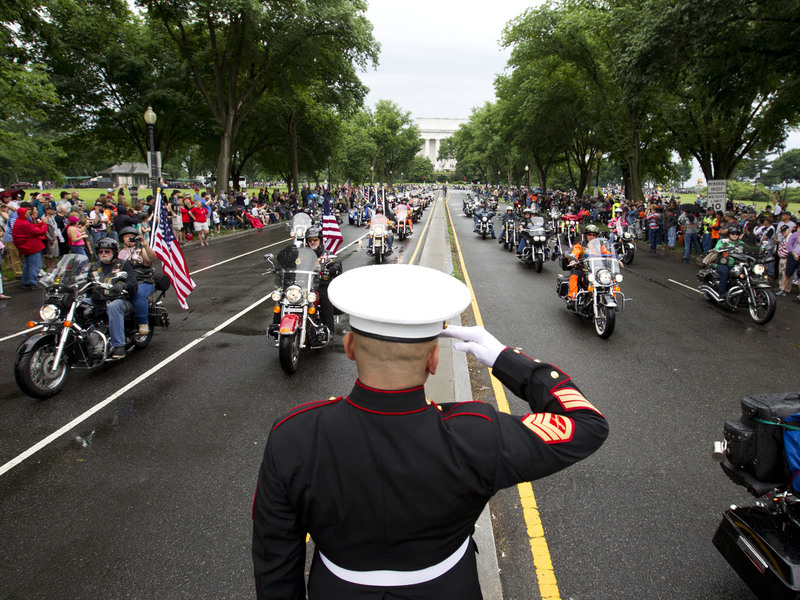 After Decades, 'Rolling Thunder' To Make Its Last Big Ride Through Washington, D.C. The sound of motorcycles rumbling through the nation's capital has been a staple of Memorial Day weekend since 1988. A U.S. Marine salutes as participants in the Rolling Thunder motorcycle rally rumble through Washington, D.C., in 2017. Organizers say the 2019 event will be the last in D.C.
Come 2020, Memorial Day weekend in Washington, D.C., will be a whole lot quieter. Rolling Thunder, the veterans advocacy group that organizes a massive annual motorcycle ride through the nation's capital, announced this week that the gathering in 2019 will be its last big rally. The sound of thousands of motorcycles rumbling through the city has been a staple of the holiday weekend for decades. But Artie Muller, a Vietnam veteran and executive director of Rolling Thunder, told NPR that the event had become too costly and that federal agencies were making it overly difficult to organize. "We're just sick and tired of getting the shaft from them," Muller said. There were problems getting permission to use the giant parking lots at the Pentagon where bikers gathered for the ride, he noted, adding that some people this year hadn't been allowed into the lot and left out of frustration. The group also took issue with what it described as restrictive Department of Defense security guidelines, a ban on merchandise sales and limits on sponsors, The Washington Post reports. Rolling Thunder Vice President Pete Zaleski told Military Times that it costs over $200,000 to host the event. "It really has exploded to beyond what we can support," he said. In a June letter to local chapters of Rolling Thunder, Muller criticized the Defense Department and the U.S. Park Police: "Despite planning meetings, agreements and exorbitant permit charges fees these DC agencies do everything they can to divert and complicate our event." Pentagon spokesperson Sue Gough said, in a statement to NPR, "The department supports the peaceful, lawful exercise of American citizens' First Amendment rights, and remains focused on ensuring the safety and security of the demonstrators and the Pentagon Reservation. The department is prepared to support the 2019 Rolling Thunder ride, as we have for the last 31 years." The Park Police didn't immediately respond to NPR's request for comment. Joe Chenelly, executive director of the veterans' advocacy group AMVETS, expressed concern over the decision on Twitter. The ride has grown in popularity since 2,500 motorcyclists first thundered across Washington, D.C.'s Memorial Bridge in 1988. It has become the world's largest single-day motorcycle event, according to Rolling Thunder. Organizers call it a demonstration intended to honor veterans and troops killed in action and put pressure on the U.S. government to find service members who are still missing. Rolling Thunder has looked into using alternative parking lots in the area, according to Muller, but none could handle the massive number of people and machines. And he said that over the years, it has become increasingly difficult to raise money as younger riders forgo purchasing the vests, patches and pins that help fund the group. The final ride in D.C. is set to take place on May 26. Starting in 2020, Muller said, Rolling Thunder's 90-some local chapters will hold smaller events across the country. He's hopeful those rides will attract a new generation of veterans and supporters. "There's a lot of riders out there that don't have the money, don't have the time off of work. ... They want to participate and they can't," Muller said. "Maybe this is the change that's needed."